University of Kentucky junior Mary Kate Elliott, from Elizabethtown, Ky., has been selected for a place at a Fulbright Summer Institute to study at Nottingham-Trent University in Nottinghamshire, England, on one of the most prestigious and selective summer scholarship programs operating worldwide. Created by treaty in 1948, the US-U.K. Fulbright Commission is the only bi-lateral, transatlantic scholarship program, offering awards and summer programs for study or research in any field, at any accredited U.S. or United Kingdom university. The commission is part of the Fulbright program conceived by Senator J. William Fulbright in the aftermath of World War II to promote leadership, learning and empathy between nations through educational exchange. Award recipients and summer program participants will be the future leaders for tomorrow and support the "special relationship" between the two nations. As a participant, Elliott has been selected from a strong applicant pool to experience the U.K. on a four-week summer program. While at Nottingham-Trent, she will embark on a multi-disciplinary learning experience, involving other U.S. students, as well as students from China and India. The program culminates during the fourth week with a showcase, in which its students present their academic and cultural findings through the mediums they explored throughout the program, such as textiles, architecture and creative writing. Elliott is a Chellgren Fellow and a Gaines Fellow at UK. She was homeschooled throughout high school, which led to many opportunities, including: Governor's School for the Arts; a 15-year long dance career; a three-year job as a level one ballet instructor; and countless community service opportunities through the Arts Outreach/Dance Touring Ensemble. The junior is majoring in English and French and minoring in dance. 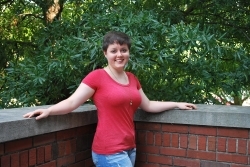 Elliott has had her works of poetry, fiction and nonfiction published in the undergraduate journal, Shale, and just recently, she won the Farquhar poetry award for her poem, "condemnation." Some of her hobbies include creative writing, knitting, adventuring and, of course, making the perfect cup of tea. Through the Fulbright Nottingham-Trent Summer Institute, Elliott hopes to explore the differences in cultures between the U.K. and the U.S. and synthesize those differences through her writing. Commenting on receiving the place, Elliott said: "I am so excited to have been chosen for this program — I know this will be an enormous learning experience not only academically, but socially and culturally as well. I'm looking forward to meeting other students from the U.S. as well as those coming in from other countries, and I'm ready to bring the skills and insight I glean from them back to the University of Kentucky." The US-U.K. Fulbright Commission selects participants through a rigorous application and interview process. In making these awards, the commission looks for academic excellence, a range of extracurricular and community activities, demonstrated ambassadorial skills, and a desire to further the Fulbright Program and a plan to give back to the recipient’s home country upon returning. Fulbright Summer Programs cover all participant costs. In addition, Fulbright summer participants receive a distinctive support and cultural education program. Each year, the commission supports around 50 U.K. and U.S. undergraduate students to undertake demanding academic and cultural summer programs at leading institutions in the U.S. and U.K. respectively. The commission is funded partially by the Department of Business, Innovation and Skills in the U.K.and the U.S. Department of State, with additional support coming from a variety of individual and institutional partners. Students at UK who are U.S. citizens can apply for a selection of programs presented by the Fulbright Summer Institute through the university’s Office of External Scholarships (OES), part of the Division of Undergraduate Education. The office assists current students and recent alumni in applying for scholarships, fellowships and awards funded by sources outside the university. Specifically, OES mentors students helping strengthen an application, develop a personal statement, practice for an interview and provides other preparation activities for the scholarship application process. Students who are interested in these opportunities are encouraged to contact Pat Whitlow, director of the OES, and begin work with Whitlow well in advance of the scholarship deadline.